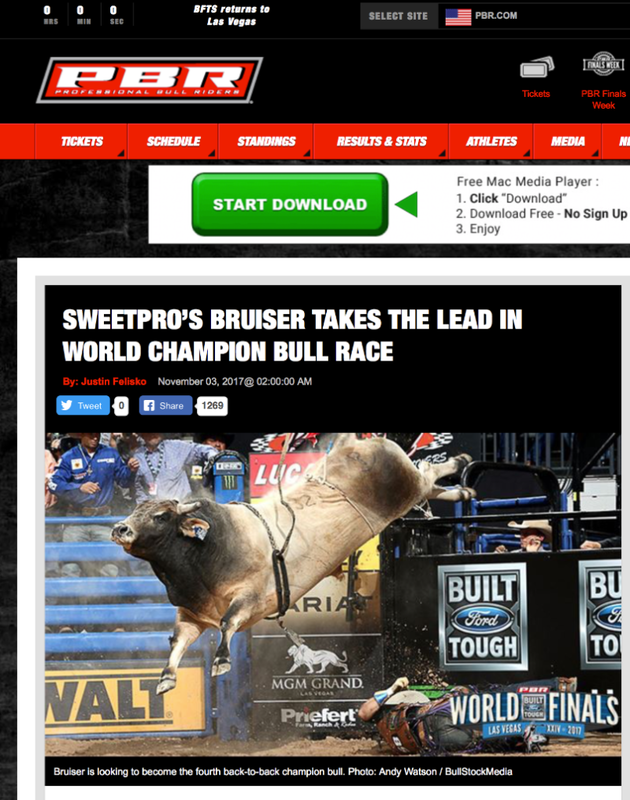 SweetPro’s Bruiser, the reigning PBR Champion Bull from 2016, has won the Bull of the Year award on the final day of the 2017 PBR Built Ford Tough Series World Finals in Las Vegas. Owned by D&H Cattle Company of Ardmore, Oklahoma, SweetPro’s Bruiser had to come from behind to overtake PBR star Pearl Harbor in the finals. Pearl Harbor was .2 points ahead of SweetPro’s Bruiser on Wednesday, but on Thursday a 47 point performance by SweetPro’s Bruiser put him slightly ahead of Pearl Harbor, which had a solid 45+ point score. SweetPro’s Bruiser took Emilio Resende on a short 1.91 second ride, and displayed some remarkable bucking heights. Click here to see the PBR video of the ride. As Page of D&H Cattle Company watched Sunday’s finals, he saw his top bull deliver another remarkable feat of athleticism, scoring a 46 to outdistance a strong showing by Pearl Harbor which delivered another 45+ point outing. All of us at SweetPro congratulate D&H Cattle Company on their winning year and the accomplishments of two time PBR Bull of the Year Champion Bull, SweetPro’s Bruiser. SweetPro Feeds is a U.S. manufacturer of premium feed supplements for livestock. The patented process in non-molasses free choice blocks uses dried distillers grains that are fermented by yeast. SweetPro products are high in enzymes, multi-class prebiotic fibers, volatile organic acids and the blend additive ProBiotein. These support overall digestion, feed efficiency, animal health and performance by keeping livestock digestive systems performing the way nature intended.